Meet Florida's newest fishing super star. 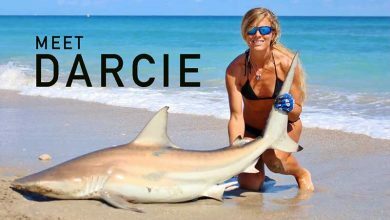 In these two exclusive videos Darcie (aka Darcizzle Offshore) shares her story and takes us out on a shark fishing adventure. 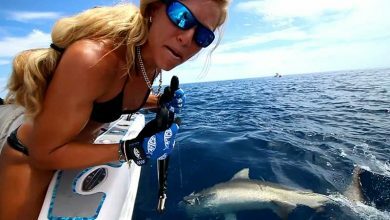 In this first exclusive film for Fishing TV, Darcie and her team head out to a known shark fishing mark off the coast of Palm Beach, Florida. The mission is to hook up to some bull sharks, famed for their hard fighting and agression. They also take the time to harvest a bit of shark bait along the way.Darcie talks through the various baits, chums and tackle that they use to attract sharks to the boat and entice a bite, and explains how the Gulf Steam makes the coast of Palm Beach county one of the most prolific pelagic fisheries in the world. Meet Darcie Arahill, one of online fishing’s brightest stars. She’s built quite a reputation for herself through her YouTube videos and Instagram account over the last few years.In this short film, Darcie introduces herself and explains how she got into fishing, and what she’s trying to achieve with her new career in fishing.